How many times has your tiny dog pooped out on a long walk and you had to carry him home? 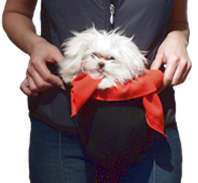 With our Pup-Poose you can carry your little around your waist when he gets tired. Around the house the pup-poose allows you to carry your little one around with you and still be able to use your hands for other things. Our Pup-Poose is a soft lycra-spandex pouch that fastens securely around your waist with a 2"wide adjustable webbing strap and a backpack clip closure. Wrap your little one in the enclosed wrap,and push him down inside the Pup-Poose The lycra-spandex pouch will hold him nice and secure. Soft chin rest for comfort too. Use attached band to make the Pup-Poose just the right size. The Double PupPoose Now you can carry both your little ones around with you. Double the fun of our single Pup-Poose without the jealousy.